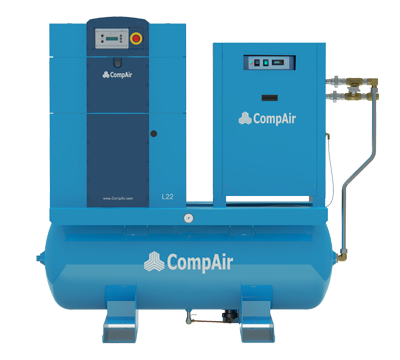 CompAir L Series offers a wide range of fixed speed oil-lubricated rotary screw compressors from 10 HP to 330 HP. All compressors are fully enclosed for low noise operation, while maintaining the smallest footprint in the industry. The L-Series product line is designed with a high efficiency, high output CompAir compression element with slow rotational speeds, resulting in reduced energy usage and increased reliability. With standard features including TEFC motors, Wye-Delta starting, microprocessor controls, thermistor protected motors, and grouped service components, the L-Series delivers real VALUE to the customer. Compressors 30 HP and below will be available tank mounted with optional dryer, which includes a 3-way bypass standard, for a complete plug-n-play Air Station. 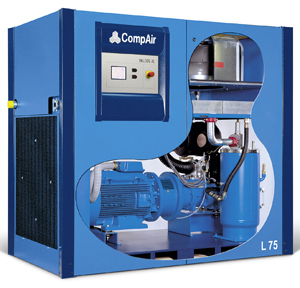 Reliable, Quality, Value, Energy Efficient.... CompAir L Series. *Complete AirStations (compressor, tank mounted, with an option for dryer) are available for frames 1 and 2.